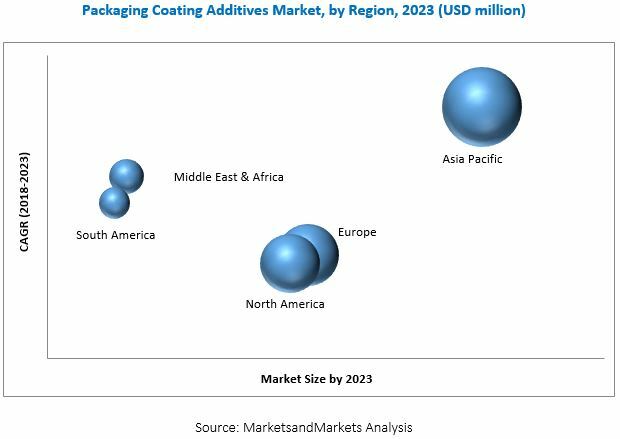 [124 Pages Report] Packaging Coating Additives Market was valued USD 656.3 million in 2017, and is projected to reach 874.5 million by 2023. The packaging coating additives market is estimated to grow at a CAGR of 4.9% during the forecast period. The research methodology used to estimate and forecast the packaging coating additives market began with capturing data on key vendor revenues through secondary sources, such as D&B Hoovers, Bloomberg, Chemical Weekly, Factiva, and various other government and private websites. Vendor offerings were also taken into consideration to determine the market segmentation. After arriving at the overall market size, the total market was split into several segments and subsegments, which were later verified through primary research by conducting extensive interviews with key personnel, such as CEOs, VPs, directors, and executives. Data triangulation and market breakdown procedures were employed to complete the overall market engineering process and arrive at the exact statistics for all segments and subsegments of the market. The breakdown of profiles of primaries is depicted in the figure below. The packaging coating additives market has a diversified ecosystem of upstream players, including raw material suppliers, along with downstream stakeholders, vendors, and government organizations. Companies operating in the packaging coating additives market include Croda International Plc (UK), BASF SE (Germany), Clariant AG (Switzerland), Lonza Group (Switzerland), 3M Company (US), Arkema Group (France), Evonik Industries AG (Germany), Solvay S.A. (Belgium), etc. This research report categorizes the packaging coating additives market based on application, function, formulation, and region, and forecasts revenues as well as analyzes trends in each of the submarkets. A further breakdown of the Rest of Asia Pacific, Rest of the Middle East & Africa, Rest of Europe, and Rest of South America packaging coating additives markets. The packaging coating additives market is projected to grow from USD 688.4 million in 2018 to USD 874.5 million by 2023, at a CAGR of 4.9% from 2018 to 2023. Increasing demand for packaged foods is driving the growth of the packaging coating additives market. The packaging coating additives market, by function is segmented into slip, antistatic, anti-fog, anti-block, and antimicrobial. Antimicrobial additives are used to prevent the growth of infection and fever-causing microorganisms such as bacteria, fungi, algae, mildew, and other parasites. Antimicrobial additives possess characteristics such as water repellency, solubility, and pH stability. They offer improved mechanical properties and high dimensional and chemical stability. The demand for antimicrobial additives is primarily triggered by the growing consumer awareness about health-related infections and the rapid urbanization and growing population in the Asia Pacific region. By application, the packaging coating additives market is segmented into, food packaging, industrial packaging, healthcare packaging, consumer packaging, and others. Industrial packaging materials such as plastics and paper are likely to sustain damage during distribution and logistics due to dust, fog, static energy, friction, and temperature change. Therefore, packaging materials are coated with additives to protect the package from damages. These additives serve anti-fog, antistatic, slip, and anti-block functions in industrial packaging. The consumer goods industry uses coating additives for packaging of luxury goods as they provide protection against scratches, abrasions, and resistance to chemicals and microbial activities. Due to the durability of low-cost plastics, they are widely used in manufacturing various packaging materials that are used in food & beverage packaging films and agricultural films, among others. It is difficult for end users to manage plastic wastes generated from these industries. Hence, several countries are imposing bans on plastic products and are implementing regulatory norms regarding the use of plastic packaging products, which affects the growth of the packaging sector. Major players operating in the packaging coating additives include Croda International Plc (UK), BASF SE (Germany), Clariant AG (Switzerland), Lonza Group (Switzerland), 3M Company (US), Arkema Group (France), Evonik Industries AG (Germany), and Solvay S.A. (Belgium), among others.